OXO Tot Glass Blocks stores and reheats meals with ease. 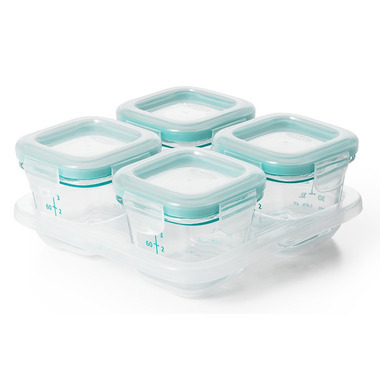 Portion, store, heat and serve baby food in one convenient container. The Baby Blocks are made of durable borosilicate glass, which is thermal shock resistant. This means they can go directly from the freezer to the oven or microwave: no need to wait until your little’s ones meal is fully defrosted before heating it up. The easy-to-use SNAP lids are leak proof to keep food fresh and minimize mess, even when taking on the go. 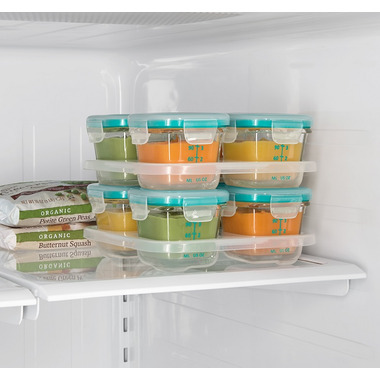 The stackable trays make for easy storage in the refrigerator or freezer.